Transparency Market Research (TMR) has published a new report titled ‘Sterilization Equipment and Disinfectant Market - Global Industry Analysis, Size, Share, Growth, Trends, and Forecast, 2018–2026.’ According to the new report, the global sterilization equipment and disinfectant market was valued above US$ 4,400 Mn in 2017. It is projected to expand at a CAGR of 4.5% from 2018 to 2026. Rise in geriatric population leads to increase in the number of surgeries that are caused due to severe diseases and performed at hospitals and clinics and increase in number of hospital acquired infection are likely to boost the sterilization equipment and disinfectant market during the forecast period. North America and Europe are likely to dominate the global sterilization equipment and disinfectant market due to rise in awareness about prevention of healthcare associated infection (HAI) and rise in focus of key players on the development of new sterilization devices in the market in these regions. Increase in number of surgeries and number of hospitals in countries such as Japan, India and China is likely to boost the sterilization equipment and disinfectant market in Asia Pacific in the near future. Increasing preference for usage of disposable medical devices, such as prefilled syringes, gloves, face masks, needles, and catheters, hinders the global sterilization equipment market. Usage of disposable devices reduces the probability of acquiring HAIs. The global market for sterilization equipment is expected to contract during the forecast period, as disposable medical devices do not require sterilization. The report offers detailed segmentation of the global sterilization equipment and disinfectant market based on method, disinfectant, and end-user. Based on method, the heat sterilization equipment segment is projected to dominate the global market, due to the presence of major players in the segment. However, the segment is expected to lose market share during the forecast period, as it does not properly work on heat and moist sensitive equipment. The low temperature sterilization segment is anticipated to gain market share. Its share is anticipated to rise from 32.0% in 2017 to almost 33% by the end of 2026 due to advantages of its sterilization process through disinfectant gases, such as ethylene oxide, which is suitable for both heat and moist sensitivity equipment to sterilize. In terms of disinfectant, the oxidizing agents segment is projected to account for a dominant share of the global sterilization equipment and disinfectant market during the forecast period. The segment is likely to expand at a CAGR of 5.0% from 2018 to 2026, and the trend is projected to continue during the forecast period owing to the high usage of oxidizing agents, such as ethylene oxide, hydrogen peroxide, which have high antimicrobial activity owing its small molecular structure. In term of end-user, the hospitals and diagnostic centers segment accounted for more than 50% share of the global sterilization equipment and disinfectant market, in terms of value, in 2017. The segment is anticipated to expand at a rapid pace in the near future. The market share held by the segment is likely to rise to reach more than 52% by the end of 2026. Rise in number of surgeries and increase in HAI are likely to propel the segment during the forecast period. In terms of value, North America held a major share of the global market in 2017. This is due to rise in awareness about HAI and increase in focus on research and development in the U.S. 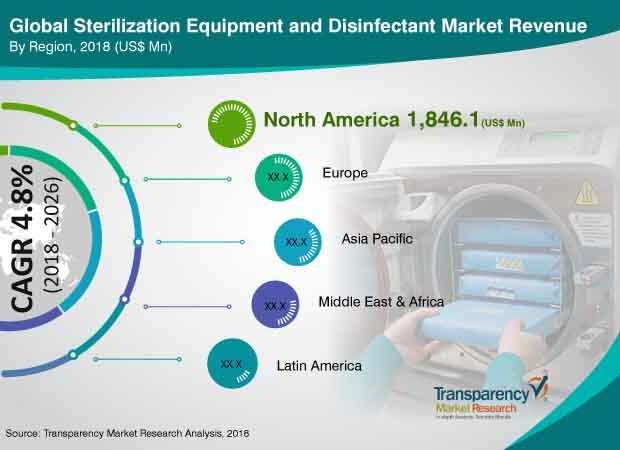 Furthermore, high prevalence of infectious diseases, such as cholera, influenza and syphilis, in North America propels the demand for utilization of sterilization equipment and disinfectants, which in turn is projected to propel the sterilization equipment and disinfectant market in North America from 2018 to 2026. Poor sanitization measures and lack of awareness about prophylaxis of diseases among people increases the rate of hospitalization and the demand for utilization of sterilization equipment and disinfectants. This, in turn, is anticipated to drive the sterilization equipment and disinfectant market in Asia Pacific. According to the British Medical Journal (BMJ), contamination of water is a serious threat in countries in Africa that witnessed an increased risk of diarrhea due to inadequate water storage. Prevention of water contamination and associated risk increases the demand for disinfectant equipment and chemicals in this region. These factors are likely to propel the sterilization equipment and disinfectant market in Latin America. The market in the region is expected to expand at a CAGR of above 4.6% from 2018 to 2026. The report provides profiles of leading players operating in the global sterilization equipment and disinfectant market. They include Advanced Sterilization Products Services, Inc., Getinge AB, STERIS Corporation, Belimed, 3M Company, Cantel Medical Corp., TSO3 Inc., SAKURA SI Co., Ltd., Matachana Group, and CISA production srl. Market players adopt strategies such as expansion of product portfolio by developing new products or through acquisitions and licensing agreements. For instance, On May 29, 2017, the Belimed Group (Infection Control Business Unit of Metall Zug Group) acquired 100% stake in Sterifast, a Portugal-based company that specializes in low temperature sterilization. The acquisition of Sterifast is anticipated to provide Belimed access to know-how and solutions for the rapidly expanding low temperature sterilization market. Moreover, it is anticipated to strengthen the company’s position as a full solution provider. Other key players are also adopting similar strategies.